The WiserWand is a steel tube with a stainless steel tip and threaded nut. Included with the WiserWand is a nozzle, shutoff, and three washers. EFFICIENT – Water the root zone with pinpoint accuracy and eliminate waste due to runoff, evaporation, and wind. CONVENIENT – Water in the midday sun, water in the wind, water when you want, water where it counts, water the root zone. COMPETITIVE – WiserWand vs Yard Butler vs Ross Root Feeder. Which do you prefer? 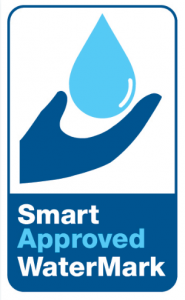 Smart Approved Water Mark certified the WiserWand in AUSTRALIA & EUROPE as a water saving tool! 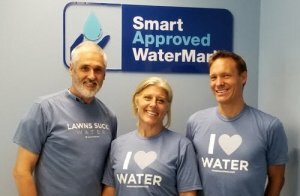 In the photo, from left to right; Tom Ryan, Founder WiserWatering; Zoe Palmer, Marketing Manager, Smart Approved WaterMark; Chris Philpot, CEO, Smart Approved WaterMark. April 17, 2018, Sydney, Australia. Certification was granted based on the May 27, 2018 study completed by Dr. Paul Lamble, Peak Water Consulting. He compared the WiserWand to a traditional spray nozzle. In the Garden Bed Test (page 13), he made the following observations. Which WiserWand is best for you? 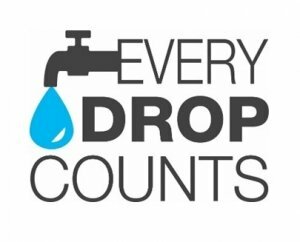 Teach kids to water efficiently and fix leaks and they’ll save water for a lifetime as will their children and every generation to follow. This is why WiserWatering donates 5% of profits to “grow school gardens” worldwide. WiserWand + Backpack Sprayer = Awesome! Water with a Backpack Sprayer. 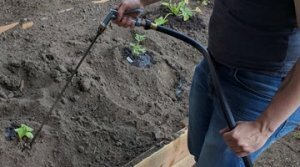 It’s an affordable, low-tech, efficient, no-hose watering solution that saves water in the 1st, 2nd, and 3rd world:) In 3rd world “water starved” regions, backpack sprayers will be manufactured locally to create jobs and save water. Water in the sun, Water in the wind, Water when you want, Water the Roots! The WiserWand crushes the competition at an affordable price! 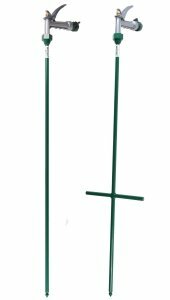 – WiserWand vs Yard Butler vs Ross Root Feeder. Got a greenhouse? Get a WiserWand? Using high-efficiency products and fixing leaks are the only guarantee of reducing usage. It’s been proven inside the home. The EPA Act of 1992 set standards for energy and water usage. For example, toilets were reduced to 1.6 GPF (gallons per flush), shower heads 2.5 GPM (gallons per minute), and bathroom faucets 2.2 GPM. At no cost to taxpayers, the EPA Act of 1992 forced companies to innovate and develop more efficient products. How many trillions of gallons of water have been saved inside the home since the passage of the EPA Act? A lot of trillions! We can’t wait for congress to set standards for outdoor watering products. Start saving today with a WiserWand. You’ll simply save water. 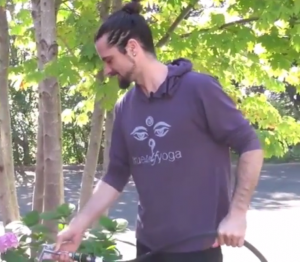 People with limited mobility find watering easier. Andrew says, “The WiserWand is so easy to use, I don’t feel the arthritis in my fingers or struggle with my cane.” It’s easy for kids too! Get a WiserWand and get your kids in the garden. When kids argue about whose turn it is to do chores, usually it’s because they’re trying to get out of something they don’t want to do. But at Ashley Smith’s house, it’s the opposite: her seven-year-old son and two-year-old daughter quarrel about who gets to water the garden. Read more. Andrew says, “The WiserWand is so easy to use, I don’t feel the arthritis in my fingers or struggle with my cane. It’s easy for Aiden too. 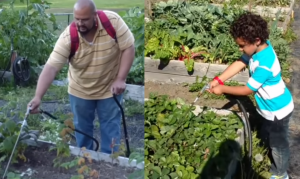 He’s 6 y/o and able to water the entire strawberry bed. It’s fun for him.” Read more. Read the reviews on Facebook too! I am very happy with the Wiser Wand. Not only am I saving water, I’m saving my landscaping topsoil, which was washing away with the sprinkler. I find that I enjoy watering and feel closer to my plants. I slow down and look at each one, appreciate them, talk to them, and care for them as I water. I am finding my “Zen in watering. Loving this tool and feeling Wiser! What’s really cool is we have a small dog. When I watered with a soaker hose it would create puddles and our dog would get muddy, even on a sunny day. Then he’d go inside and create a mess. No more muddy paws with the Wiser Wand. My house is cleaner and I’m saving water. Also, sometimes with the soaker hose I’d forget to turn off the water and it would run all night. Doesn’t happen with Wiser Wand. When I release the trigger the water turns off. The foot pegs allowed it to go into the ground everywhere, even though we have tons of rocks. After a little water, it would always go in all the way. I have been using the Wiser Wand for several months and it’s great! It’s the perfect tool for getting water right to where the plants need it. 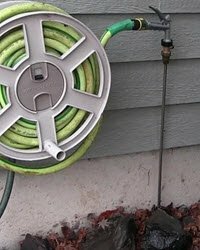 I’m an avid gardener and I do have a sprinkler system, but I still need to water certain areas and plants by hand and the Wand is perfect for that. It gets the water right to the roots and makes for healthy plants and wise water usage. Two thumbs up from this gardener. I love to using the Wiser Wand knowing that I am not wasting any water. For me, watering and tending to my lawn is a great way to wind down at the end of a long day. I will usually turn the Wiser Wand on low, stick it at the base of my grape vines or fruit trees, leave it for a few minutes and tend to other plants. This saves me a lot of time and leaves me feeling very giddy and accomplished. We are so thankful Tom created and shared the wonderful Wiser Wand with us. This year, due to the heat and lack of rain, our cucumbers were really struggling. We began using Wiser Wand to soak the roots, where the water is needed, and our cucumbers perked up within the week. We had sweet, yummy cucumbers to share. We are so grateful. Tom let me test out the Wiser Wand this summer and I found it to be a quick and efficient way to water the garden. 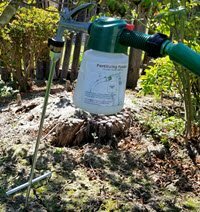 I especially found it useful in my greenhouse and for deep watering the trees and bushes that were struggling during the drought: no wasted water and you can just set it in the ground, walk away and do other chores while it is watering right where it’s needed. Thanks, and good luck with your project! Tom gave us both a Wiser Wand and a shorter one to water our pots. After showing Vern how to use it, he couldn’t stop watering. We have a large garden with a variety of plants, shrubs, and trees in all shapes and sizes. Once a week we do a deep watering which had taken four hours. We were done in half the time with the Wiser Wand and our water bill was half as much. With the Wiser Wand, I water my vegetable garden faster and better because I only water the root zone and I adjust the water flow based on a plant’s needs. The Wand lets me easily snake through vegetable beds and get close to seedlings without worry. I don’t waste a drop watering leaves, weeds, mulch, or paths and because the water is directed at the base of the plant there is no waste due to evaporation or runoff. It saves water and work because there are fewer slugs and weeds. I have a number of fruit trees and large ornamental shrubs and for this the benefit is obvious, as the foot pegs allow me to push the tip down into the roots and give the tree a deep drink without any runoff. As the tree is being watered, I’m free to weed and prune. So it cuts the time spent at a plant and allows me to focus on other aspects of gardening. The more I use the Wand the more uses I find for it. It’s helpful in planting seeds and new starts as I can make and water my holes at the same time. I can set the water flow to a trickle and drag the tip along the soil to plant delicate seeds like carrots and beets. With two people planting it’s a snap. The fact that I can do almost all of the things I have described without effort or bending over makes my once tedious, wasteful, and unpredictable watering chore into a quick walk through my garden. I also find that since each plant is getting more water I can eliminate one of my waterings. Tom lent me the Wiser Wand to try out this season. I used less water and irrigated my crops more efficiently using the Wiser Wand. It’s able to get down deep to water the roots and promote root growth well below the surface. As a result, my plants were more resilient to the long, hot, dry afternoons we experienced this year. I had the biggest production ever this year, due in large part to using the Wiser Wand. I will definitely buy one for my vegetable garden and for gardening my perennials and annuals. The area in front of our business is mostly bare, with 25-30 plants scattered about. I watered with a sprinkler for 30 minutes every couple of days. 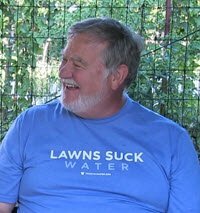 Tom attached a water meter before running the sprinkler and 150 gallons were used. The Wiser Wand only used 15 gallons! It’s amazing how much water we saved and the drop in our water bill. We’re a new business so it is important to save where we can. We spend less time cleaning too. Before, water would run down the sidewalk and customers would track in water and dirt. Lets me deeply water only the root zone. This is crucial. I can direct the water to go only where it’s needed: to the roots of the plant—not on the leaves, which can be a cause of disease, and not on the surrounding soil that is only growing weeds! I can meet the water needs of each plant: More water for this guy—less for this other one. I can care for each plant as an individual. I save water! More than ever, conserving water is part of my environmental consciousness. I only water the roots—not the sidewalk, street, lawn, and sides of my house. It’s a very effective, water-saving device! I recommend the Wiser Wand without reservation! I used Wiser Wand during the Summer of 2016. I found it very useful. We have a lot of mature rhododendrons in our yard. The watering tool was effective at getting water to the roots. We also had some new dogwoods planted that spring and the tool helped me get water deep for better root growth. Tom’s invention works! I’ve used it for two months. I don’t have to bend over as much in the garden. I do a lot less wasting of water on spaces that don’t need to be watered. I get closer to the roots and I think my tomatoes like it a lot because they don’t like water on their leaves. I’ve been using it pretty much every day and I like it a lot. When I watered with a sprinkler everything was soaked, but the plants and trees weren’t watered deeply. With the Wiser Wand I can water anytime and it’s a lot faster. I can be more directed with my watering and water below the wood chips and to the roots where the plants need it. Take the Wiser Challenge and find out how much you’ll save. With the WiserWand you water the root zone, not leaves and the space between plants where weeds and slugs call home. Keep’em dry and they don’t thrive. Therefore you could say using a WiserWand is comparable to a life time supply of weed and slug repellent! Watering isn’t a chore, but a walk through the garden. Naturally you tend to the garden as you water. Saying “hi” to each plant and showering their roots with water as you pick and deadhead flowers, clip branches, pull weeds, and harvest fruit and vegetables. Be “engaged” when you water and get lost in the garden. Get a WiserWand and get your kids in the garden. It’s been proven over and over that kids like to water with a WiserWand. 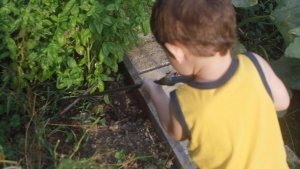 Two mom’s share their thoughts on watering with young children. 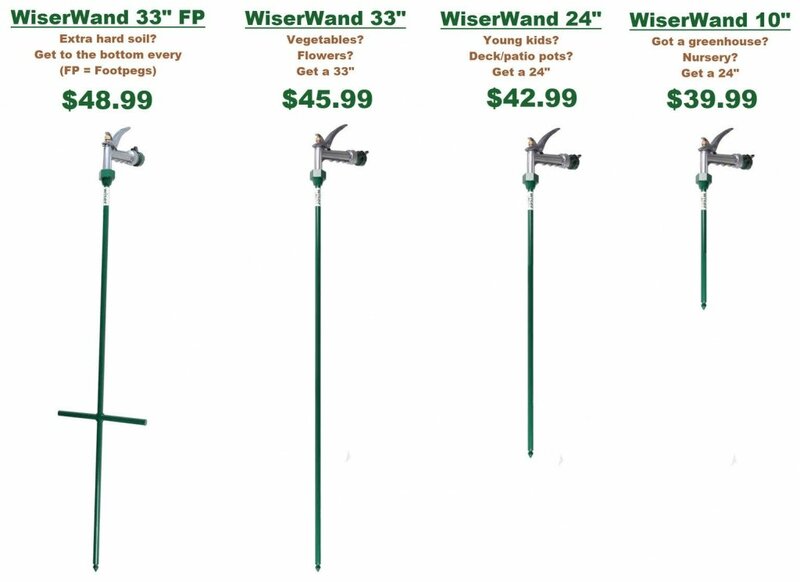 The WiserWand waters the root zone of every plant, shrub, and tree in your garden – from the tenderest of seedlings to established trees and everything in between without wasting a drop due to runoff, evaporation, or wind. Andrew and his 6 y/o son Aiden, water with ease. Andrew uses a cane and the WiserWand makes watering a breeze. Read Andrew’s story. The WiserWand never sits. Always at attention and ready to water. When you’re not using it, poke it in the ground, don’t set it down. Roots need water and oxygen. The WiserWand delivers them at the same time. Mulch works without water. The Wiser Wand waters the roots, not the mulch. Watering mulch is a waste and encourages slugs and weed growth. Water in the wind, water in the heat of day, water when you want and don’t waste a drop. Never miss your mark with the “high-efficiency” WiserWand. Get updates, gardening tips, and exclusive offers from WiserWatering! Steve switched to the WiserWand from Drip and saved a ton of water. It’s easy to find and hard to misplace because the WiserWand stands tall.